If you get 2 or 3 eggs on the Yum they don’t show until you spin the WOW or log out then log back in. The free egg isn’t an egg, it’s an egg prize. If you leave your dock open to the new items in dock, you’ll see exactly what you got right away. WOOHOO for eggs!!! Gotta catch em all!! Update on hubby. Dr. Said everything fine! Just sprained it! The surgery held up!!!! Yea!!!!! He also saw knee dr. They did cortisone shots both knees..3 days later he said NO MORE PAIN!! Again yea!!!! Meet heart surgeon on wed. Heart surgery scheduled for may first..so I had to reschedule MY surgery yet again as I was supposed to go on may 2nd. .ugh. I’m going in on 8th. dixiecup – thanks for the info!!! i made it bold in hopes everyone will see it! nita – ikr! i’m calculating how much time i think i’ll have to catch them! Ok now the crazy stuff..
Another murder block away.!!! This time out of my cameras reach. Not random. Two were shot one passed. They were fighting somewhere else and chased them into our neighborhood from what I got so far..THEN last night around 7pm a plane crashed and took out the power . 40 percent of the city or more was OUT. The plane landed in highschool ball field. Thank goodness no kids were there! Plane took out high tension wires. Both pilot and passage lived. But are in hospital. Talk about scared enough to poop your pants! I can only imagine what they were thinking as they went down. You would have to kidnap me and knock me out before I’d ever get in a small plane!!! I hope they realize how lucky they are. And I didn’t get to play ww all night last night, so trying to catch up. Sooo much to do. But at least webkinz newz is finally working right.! Hope you all have a wonderful weekend! We are going out with our 30 YR old son tonight. He needs some time with us, or so he says…cue the AWWWWWS! Aparently he misses us, go figure.. Sorry to hear your surgery has been put on hold, yet again, but if hubby’s heart surgery works like last one, he won’t need to see a doctor for a while. Maybe he’ll be well enough to be able to care for you when you go in for yours. i used to post the sheriff reports about cows in the road……..
Local Cow Tipper, Fred Hartford became a laughing stock when he tipped back one too many today and found himself under Bessy for about 3 hours while emergency crews struggled to tip her back on her feet. Lol, you are all funny! Love the local news story dixie! Dee, if I thought it would be a best seller I’d write it..but honestly..I doubt anyone would watch it. Too gloomy! Lmao. Moms, not much shakes me anymore..you grow numb to it. And cynical. .just two more dealers gone. The on time I feel bad about it is when innocent people get hurt because of people like them. Had a nice dinner and played pool with our kiddo. Home early. Piggy is scratching at EVERYTHING cause he’s ticked we went out. Being annoying..he’s about to get water sprayed at him if he don’t stop…his water bowl pulled along kitchen floor is like nails on a chalk board..
Good night my friends..sleep well..
Well, I guess I could’ve elaborated and made the story go on a bit further. First off, I could’ve made the story more about his daring farm escapades in Cow-tipping becoming more of an extreme sport because out of boredom he chose to increase the level of excitement by choosing a Bull to tip. He blind-sided the bull with a red cape and effectively tipped him over. In doing so, he inadvertently wound up under the bull. With the cape covering the bulls eyes, he naturally thought it was night time, so he promptly fell into a deep slumber. This time the EMT’s called the police and Fred was arrested for driving a Bull-Dozer without a licence. Feeling so out the loop here on the blog !!! Will have to go back and read up on previous posts by everyone… This week has been horrible… all consuming and energy draining… Hopefully next week will be better ! Can’t wait to have a little down time to catch up in WW and here…. Chants.. so happy to hear your hubby’s appointment went well and no damage to previous surgery !! Sorry your surgery is needing to be postponed again !!! and can’t image all of the excitement going on in your neighborhood !! 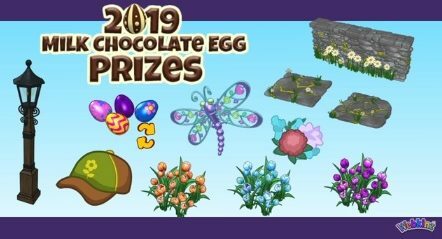 I am finding that Kiwi Medallions appear much more regularly when doing the Crystal Treasure game .. can collect all five in about a half an hour… along with the chocolate eggs !! No skunk yet… anyone having any luck with that?? dee.. I am jealous of your 80 degree temperature !!!! Supposed be sunny here today which I am thankful for … but chilly..
gaga – so glad to see you “back” this morning! with work & two floaters, you have to be so busy!!! chant – i’m glad your dh is healing & didn’t have too much of a set back! Chant – Glad dh is fine! Lots going on in your world between the upcoming surgeries, murders & plane crash! Wow! Some of my kids are home this weekend. Lots of cooking. Last night I made pizza. Tonight we are celebrating the birthday of my 2nd ds. (It is on Monday). The cake I made flopped. Maybe I took it out too soon? Anyway, will eat it anyway. LOL! I’ve been watching Lord of the Rings with two of my kiddos. We are on The Two Towers now, but took a break since dh wanted to watch baseball. Not keeping up very well with WW with all the activity here, but that just means doing a couple of accounts instead of all of them. i am toasting sesame seeds as dh said he was thinking about making bagels! and i do not see the skunk in the egg prize pool? am i blind? I hope you’re all having fun collecting Milk Chocolate Eggs I know I am! Thanks for the new post, moms! As soon as I saw those pretty tulips, I immediately thought of you! Do you have a favourite colour from this year’s batch? Aw Puma, it’s no fun being woken up in the middle of the night by a meowing cat! We went through that needy phase with both of our cats, too – giving them lots of attention during the day and setting up their sleeping quarters in our laundry room (with a bed, litter box, food dish and water bowl) helped a lot. Hopefully Clover will start sleeping through the night soon. Hey, Chant! I’m glad your husband is okay, and I hope all goes well with both of your upcoming surgeries. Hugs! And oh my gosh, I can’t even imagine all that goes on in your neighbourhood! I’m glad the occupants of the plane survived. I hope your son is having an awesome birthday, Queen of Sheba!